The frequency with which the convoy of Kogi State Governor, Idris Wada, is involved in accident has become troubling. This feeling was hardly palpable Thursday when the Federal Road Safety Corps Marshal and Chief Executive, Osita Chidoka, fielded questions from journalists during this year's Africa Road Safety Day/ World Day for Remembrance of Road Traffic Crash Victims. Chidoka disclosed that convoy of Kogi State Governor, Idris Wada, had crashed three times within three months. The former National President, Academic Staff Union of Universities, ASUU, Prof. Festus Iyayi, died in an accident involving Wada's convoy. Iyayi was on his way to Kano for the National Executive Council, NEC, meeting of ASUU. Chidoka also said the Kogi State Government had not sent its convoy drivers for a special training which the FRSC designed to certify drivers for convoy driving. He said FRSC team was still collating the facts to understand the actual cause of the accident that took the life of the erudite professor. 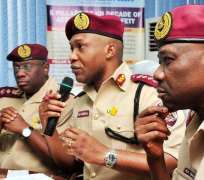 The Corps Marshal added that it was still too early to determine the cause of the accident, adding investigation by FRSC was ongoing and would be made public when completed.